GB Taekwondo say European champion Lutalo Muhammad, who was nominated ahead of world number one Aaron Cook for London 2012, has received hate mail. The British Olympic Association has refused to ratify Muhammad's selection, but his and Cook's fate is expected to be revealed by the end of the week. "It's tremendously disturbing," said GB performance director Gary Hall. "Fans of Aaron are turning against Lutalo which is absolutely unjust." Hall says, having spoken with Lutalo's father, Wayne, some of the mail is "verging on the line of abuse" and they are considering whether any legal action needs to be taken against these people. "They [Muhammad and Cook] both entered the race together and it's unfair how it's been portrayed," Hall told BBC Sport. "No-one took any recognition of the performances Lutalo has displayed, and the fact he has beaten Aaron and vica-versa and it's a fair competitive challenge that's been great to see for GB Taekwondo." Last week, Hall said no 'witch-hunt' has been conducted against Cook, and their decision to overlook him for Olympic selection had nothing to do with any lingering resentment towards the fighter for quitting the GB programme last year. GB's performance director did, however, reveal the public backing of Cook from previous Olympic and Paralympic champions Sir Matthew Pinsent and Baroness Tanni Grey-Thompson had not helped the situation. "How this story got so one-sided, I just think it's potentially the influence of the media machine behind Aaron," he said. World champion Sarah Stevenson has since come out in support of GB Taekwondo by insisting the focus should be on performances and not the world number one ranking that Cook currently holds. The 29-year-old from Doncaster says she has been impressed by the attitude Muhammad has shown in training. "Lutalo's flying in training and almost seems like there's nothing wrong," Stevenson told BBC Sport. "I can't speak for Aaron but Lutalo seems to be doing really well and we're all trying to stay really positive, focus on training and keep going." World Championship bronze medallist Martin Stamper, who won a tense battle with European champion Michael Harvey for the 68kg Olympic berth, says he has sympathy for both Cook and Muhammad. "I do feel sorry for them both and I just hope that it gets sorted out as quickly as possible now so either one can focus on the Games," said Stamper, who also branded those sending hate mail to Muhammad as "idiots". "It's not his [Muhammad's] fault, he's been in the academy for six months and he's done better than anyone I've seen. "He doesn't deserve any bad press at all, he's done his job - if someone's going to give him an Olympic place he isn't going to turn it down. He's going to train as hard as he can for it." 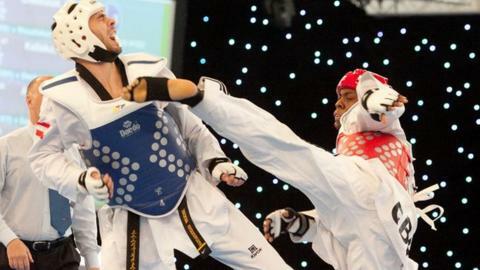 GB Taekwondo, who officially named three athletes for London 2012 last week, will meet on Wednesday morning, in the presence of a BOA representative, to consider the remaining 80kg division. The BOA have insisted all members of the selection panel must vote for either Cook or Muhammad, after some members abstained in the previous selection meeting. The sport aims to nominate an athlete by Wednesday afternoon and are hoping the BOA's Olympic Qualification Standards (OQS) panel will ratify this choice by Friday at the latest.